Way back in the day, when Ryan and I were living in Madrid, we had befriended Mary O’Conners, director and co-owner of Planeta Vino. Tall, sassy and determined, she’s an ex American Air Force officer that imbues aÂ presence not to be recognized with, especially when it comes to Spanish wine. Mary is WSET certified and is a member of both the Union Española de Catadores (Spanish Wine-tasting Association) and the American Society of Wine Educators. She and her husband, Miguel, became fast friends, people for whom we could share not only our passion for wine and food, but also as Americans with businesses dedicated to Spanish wine. And trust me, there aren’t many of us in Spain. 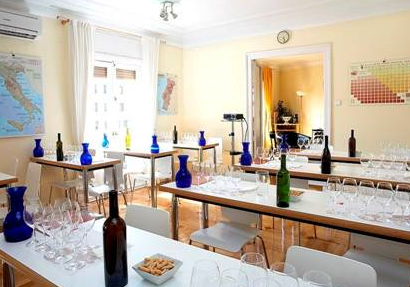 Today, Planeta Vino is one of the top wine schools in Madrid, geared to both Spanish and non-Spanish alike. Located in the stunning and quaint neighborhood of Alonso Martinez, their cozy fifth floor classroom with high ceilings offers the perfect blend of both intimate and professional. Having taken the Intro to Spanish Wine Course 3 years ago, I can honestly say that I can credit Mary with much of the foundational information I know on Spanish wine to date. Dynamic, intense and engaging, it’s not a course you’ll nod off out of boredom. If anything, you may need a siesta after the course from the amount of valuable information you’ll walk away with. Below are some questions fielded by Mary, followed by an interview conducted by MocaenBocaTv. Please don’t hesitate to ask any additional questions in the comment’s section below. What are some of the major misconceptions you consistently come across in your classes about Spanish wine? I would say most of our foreign clients come pretty open minded about Spanish wineâ€¦often they have limited exposure (though they are often quite knowledgeable about wine in general) and sometimes much of it is to Rioja, so maybe they assume many Spanish wines resemble that style. But in general they are very open mindedâ€¦we generally find they have far more pre-conceived notions about Spanish cuisine than wine. Our Spanish groups have far more misconceptions about Spanish winesâ€¦for example that Rioja/Ribera are the “bestâ€, the Gran Reserva must be the “bestâ€ etc. Do you believe that Spain has become a better advocate for itself in how it markets Spanish wine abroad? Slowlyâ€¦very slowly there are signs of improvement. I think the product itself is the best advocate at the moment, offering great consistency and quality at good prices. The international profile of Spain in generally is rising and with it the wines. Spain is getting more press in major international wine press also, which is very helpful. Spanish initiatives are certainly underway but there is much more to be done. Since the inception of Planeta Vino in 2005, you have clearly grown immensely, offering a wide variety of courses, tasting and classes. Has there been any unsuspecting shifts in your business such the type of audience your catering to or the types of courses you’re offering? Though American groups still make up a large percentage of our clients, we have had many more groups from northern Europe than we expected and immensely more Spanish groups as Spaniards become more and more interested in learning about their wines. Also lots more corporate groups and team-building events than we expected. Now that summer is here and we’re getting loads of requests for suggestions on what visitors can experience in relation to wine, are there new events or courses tourists can take advantage of at Planeta Vino? The vast majority of our groups are looking for a private tasting, which we can offer any time or day of the week and on any theme the client wants. Our private tastings can be arrange for groups from 1 to 20 people in our wine space and for bigger groups in a restaurant/hotel setting. However we understand that a private wine tasting can be quite expensive for some budgets. We do offer a sign up wine class every Monday night at 8PM. It is a fun, interactive introduction to the wines of Spain. For 35€, we have a two hour class presenting all the major themes in the Spanish wine themes and illustrating it with a tasting of 8 wines from around Spain. There are also some light tapas served. Follow this link for more information see our Monday night class. Do you have any future projects we should be aware of? Nothing specificâ€¦we can always design a wine event to suit the needs of any clientâ€¦the more challenging the request, the more fun it is! Mary, thanks so much for taking the time to answer our questions right before the infamous Spanish exodus for vacation, and we hope many of our readers will swing by your classroom to get their crash course on Spanish wine. PS if you do sign up for a class with Planeta Vino, tell them Catavino sent you, and then come back here and tell us what you thought!! !